It is beginning to dawn on me that the 7 of 10 events have slowed down from that which was predicted. Considering that there has been an uptick in souls becoming more service to other of late because of floods, earthquakes, weather extremes, revolution, and other soul testing situations. Is what I am noticing just a coincidence or is there a connection. Can the increase in service to other souls have a dampening effect on pole shift events? Are you allowed to update us on the latest decisions of the council of worlds regarding our planet? We have been asked this question before, whether the pole shift is being deliberately delayed, and our answer has been "no". The Council of Worlds considers the pole shift a natural event, like a hurricane or tornado, like a lightning strike, and these are not averted for humans. Drought and starvation and flood occur, and are not averted. The Earth is considered your schoolhouse, and natural events are an opportunity for you to reach out and help your fellow man, to be a hero or share what you have with others, and as such a necessary part of your schoolhouse. Then this is contrasted with what we have revealed about the Council's decision on simulating the seasons, so that freezing and frying will not occur. Is this not averting a natural process? And what of the Call, where many reaching out and giving the Call for deactivation of nuclear devices is answered, so that the visitors are allowed to intervene. How far does this type of intervention go? The Call is given on many matters, and where given with consideration of others as the motive, is heard. The nuclear issue has been an intense concern of many, for many years, and goes unabated. It was not only the issue of your concerns, humans concerned about other humans living in regions that would be affected by nuclear disasters, but also our own voice, as we as future inhabitants of planet Earth have a shared interest. But all Calls to delay or avert the coming pole shift have not resulted in a decision by the Council of Worlds to cancel this natural event. The reason is simple. Nuclear warheads and installations are a man-made thing, where the passage of Planet X is a natural event. If in the hands of man, or because of the hands of man, the Call can affect the outcome if intense and sincere enough. But floods and droughts and plate movements cannot be altered by the Call. The Council has allowed a simulation of the seasons for many passages, back long before man was engineered into his present form, long before the ape was even present as a predecessor. This was to keep the Earth as a biosphere for the future, as it was a rich planet, full of life and potential. Is this not interfering with a natural process? It is, and the Council has this right, to declare exceptions. Such exceptions are extremely rare, and are certainly not done in response to a Call from one trying to save themselves or their lifestyle. For example, we have stated that intervention as a healing must in each and every case be approved by the Council of Worlds. Thus, these matters, and protections, are extremely rare and only conducted where the Tranformation process would be affected one way or the other by lack of an intervention. Nancy was allowed to have a mild stroke in 2005 to force her to get on numerous pills for blood pressure, blood lipids, and diabetes. The alternative would have been nightly visits by ourselves, not tenable. 1. Will the wave/water really come so far into the country that it also will affect the town of Stuttgart?! If yes, this would happen through the European tsunami and not through the pole-shift later? (i.e. I assume that I dreamed about the European tsunami and not of the Earth changes later). Or was the dream only to make me awaken and realizing about the pole-shift and to prepare. 2. How will the Southern part of the Black forest (located in the Southwestern part of Germany) make it through? Will it get affected from the mountain building from the south (alps) and therefore be an unsafe place meanwhile the pole shift? Or will it be quite safe and a good place to be later? Or will it be as unsafe as the part of Switzerland when it get confronted with the flood coming in from France? Stuttgart will be safe from both the tsunami and the post pole shift rise in sea level. It states in the intro to this chat that you are to go through 7 Steps, with a convenient link. Step 3 of the 7 is to determine your elevation vs a vs the 675 foot mark. Nancy did this for you, and you can see that Stuttgart is well into the safe zone. In Step 3 it also states that the guidelines are to be 200 feet above sea level and 100 miles inland to avoid the pole shift sloshing. Clearly, a location that is over 100 miles from the coast and above the 675 foot mark sea level wise will be clear of the pole shift tides too. So what can we conclude? You can certainly type a question and do research, as you are aware of our prediction for France and Switzerland and the tsunami. You are pushing past the obvious, thus, and demanding a validation of your dream. Surely this meant something as tsunami's are predicted for the region. And besides, its your dream! We are not here to validate dreams, to reassure, to confirm conclusions reached, or tell you what direction you should go. You are in charge of your life, and only you can, in the end, sort out your dreams. This is not a dream analysis chat, and we suspect you are attempting to slip in such a function under the guise of a question on geography. Do you think Nancy and ourselves have nothing better to do than hold your hand in this manner? We have seen a few questions for Mexico, but possibly the Zetas could elaborate a little more on the effects to Central Mexico, notably the volcanic mountains that run east to west separating the north and south Sierra Madres during the 7 of 10 and, if possible, the PS event itself. Some of the volcanoes are old and have already blown their tops thousands of years ago, but possibly new ones will erupt? Is a trench still our best chance of survival in these steep mountains during the earthquakes? The hillsides are not that stable now or in years past with rains. Thank you. Your answer is in the rock strata of Mexico, which we encourage you to research. 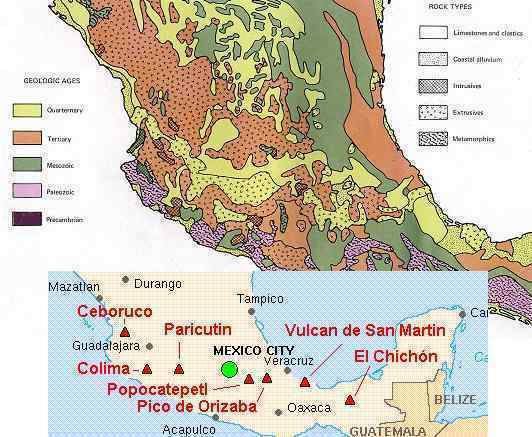 The volcano belt of Mexico, and its active volcanoes, almost precisely follows a particular rock strata, which has been formed in the past from extruded magma, and has outlets to the magma today. Avoid these areas. Volcanic ash will flow to what is now the south in the Aftertime, so the best bet is to head north of this volcanic belt, into what are now the deserts of Mexico, which will bloom in the Aftertime. We are often asked how the cover-up will break, as it is at present a standoff, at least by the great powers who dominate the scene. The US, having been at the helm of all decisions over revealing either the alien presence or the approach of Planet X, is most reluctant for the cover-up to break. There is intense reluctance by so many participants, that any move to reveal the truth to the public is sabotaged. Assassinations occur, and increasingly savage threats are made. Outside of the US, the urge to tell the truth has resulted in many countries finding a way to have the discussion before their public. This incident in Taiwan is one such incident. This is a monster sun, one of many personas that Planet X presents. Taiwan presented the evidence, stated what many on the Internet are saying, then gave a reassurance and an official explanation for the phenomena under discussion. They have, in short order, just informed the public that Planet X, aka Nibiru, is indeed in the skies, near the Sun, and the prophesied cataclysms are not without basis. They have even given the public search engine words to use in order to hone in on the subject, and learn more! Who in the public would believe the excuse given, that the Sun has been reflected off a cloud bank! Those giving the excuse cannot come up with an example, ever, from the past! Because the media presented this as a debate, with both sides commenting, they cannot be accused of breaking the cover-up. S Korean TV did something similar recently. The final product presented Nancy's evidence, then juxtaposition NASA refuting it all, and then let Nancy have the final word. NASA's arguments were then seen for what they are - inadequate. Will this media technique become popular, and used elsewhere? This and other such techniques are likely to be used, as the evidence becomes so much more compelling, the Earth changes in the news, and the public demanding an explanation. I've been reading about the Pole Shift and Planet X and I live in NYC. I have a few questions that would apply to anyone living in NYC: With the water levels rising, will NYC be completely inundated? Or are there some buildings that will withstand this shift? Is there any public transportation that will not be available about a week before this happens? If I cannot, where would you recommend residents go near NY? We are presuming that you have read our prediction for New York City, during the pole shift, so are in some sort of denial. If we say that all who stay in NYC despite our warning have a death wish, then what is that saying about your questions? 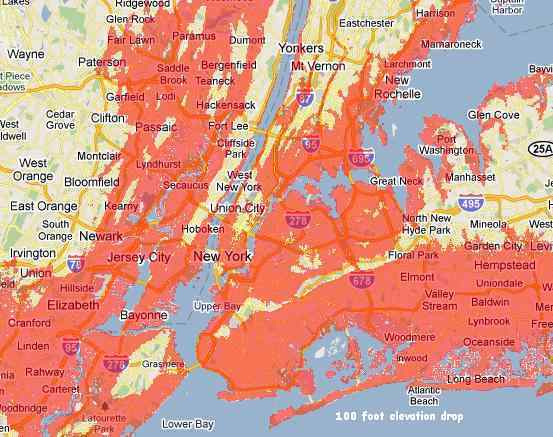 Nancy has done a simple elevation check, and found that parts of NYC begin getting flooded at 10-20 feet, and the entire city area will be under water at 100 feet. This means that your skyscrapers, if left standing, would have 600 feet of water around them. Were you avoiding the harsh truth? In the Safe Locations information for NYC, we stated that tall buildings will vibrate at different rates during the earthquakes, bash into each other, and thus collapse. This is in addition to what is known for city dwellers everywhere - exploding gas mains and water mains, so fires cannot be extinguished. So are you planning on staying in your cozy city, and living in whatever sticks up above the water, whatever has not been burned, with others who will be starving and looking at you as a meal? This is your plan? One can read behind your questions and see someone who is reluctant to move, so inconvenient, so many perks where you live now. Your question about public transportation again shows your reluctance to engage the facts. The bridges will be down. Any rail service impossible due to twisted rails. The waters sloshing about so boat service is inconceivable. Despite reading on the matter, you still cling to your delusions that it is safe for you to linger. This is denial, folks, even among those willing to acknowledge the trends and the facts. As per Zetas' comment last week " At some point, the depths of sinking we have predicted will be reached. It does however afford those in Indonesia more time to adjust to the situation, and this is all to the good." Could Zetas comment how long it takes to reach the predicted depths of sinking from now on? When plate undulation started promptly after the plate tongue holding Indonesia started to sink, we informed the public. On December 31, 2010 in fact, before the year's end. Prior to that, we had stated the sinking would take 2-3 weeks. It is now at 10 weeks, and counting. Plate undulation is not something that stops, once it starts, as momentum is involved. Sinking only commences, again, when the curve of the Indo-Australian Plate under Sumatra and Java lifts, which is only part of the undulation process, a minority of the time. This can be computed if one looks over the documentation Nancy has provided on buoy readings. Where the lift lasts for a days or two at most, the period of time when the curve is pressed down again lasts for a week. Thus, sinking could be assumed to be in process only 1/5 of the time, 2-3 weeks thus taking 10-15 weeks, and this pace assuming no other interference with the sinking process is involved.